When I woke up this morning, I was certain that I was seeing things. There was just no way that the fluffy white magic so gently gracing the trees outside my window was there. It just wasn't. As my eyes grew more accustomed to the dimness, I realized that the "fluffy white magic" wasn't even fluffy. It was wet and windy and hurling itself around my house. How gross. So I worked from home. I've made the mistake of living on the opposite end of the city from my job and on a day like today, I *knew* that the trip in would be tripled and that my day would be shite. So I cocooned myself in a delusion of warmth and curled up on the couch with my laptop. In this vein of delusion, hallucination and wishful thinking, I decided to head for a sunfilled, culture-rich coast for my dinner inspiration. 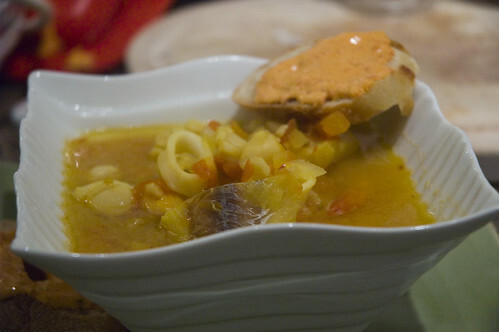 Last year, when hubs and I went on our honeymoon, we were fortunate enough to visit Nice for a couple of days - the provençal flavours seduced our tastebuds and it was with that thought in mind that I crafted my bouillabaisse. This soup is subtle....like French wine, French cuisine relies on delicate subtleties to overwhelm and surround your tastebuds. For me, there are some days when I want something bold and in your face (like an aggressive curry) and there are other days where the taste of sunshine and freshness are all I need to perpetuate a feeling of sunshine and seduction. This soup would be a brilliant match with a rosé - personally, I have been loving the East Dell Summer Rosé. I didn't have any, so I opened an Italian Soave, which was bold enough to take on the saffron-laced feast. It is imperative that you accompany your bouillabaisse with the requisite toast and rouille, and that you also be able to imagine yourself overlooking the turquoise waters of the Mediterranean. NOTE: I used all frozen seafood. And I cooked it from frozen. Took a little longer, but it worked out fine. :) If you want to wow people, you can spring for really high quality seafood, but it's also great with the less expensive frozen stuff. 1. Preheat a broiler and adjust the broiling rack so you can broil. Put 1 T of oil in a large dutch oven. Peel and quarter the onion. Peel the garlic. Put the onion and 3 cloves of garlic in a food processor. Pulse just until chopped. Scrape into the pot, raise the heat to medium and cook for 2 minutes. Meanwhile, core the tomato, and pulse it in the food processor (if using canned, just drain). 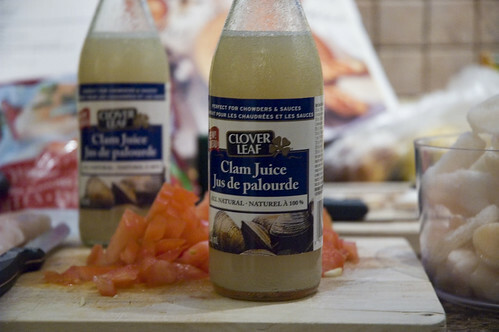 Open the bottles of clam juice. 2. Add the tomato, clam juice, anise seeds, salt and pepper to taste to the pot. 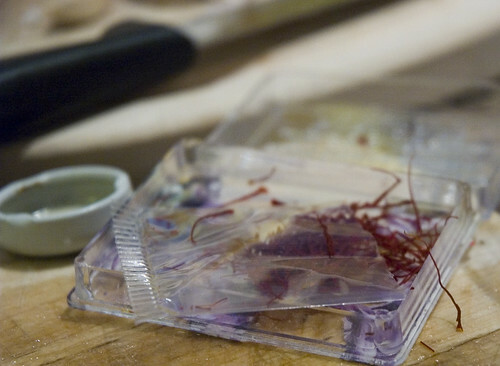 Over the pot, crush 1/4 t of the saffron between your fingers. Stir well, cover, and bring to a boil. Meanwhile, cut each piece of fish in half. Reduce the heat under the pot to medium, add the fish, cover and cook for about 5 minutes. When the soup returns to a boil, add the rest of the seafood (as mentioned, I used the frozen stuff - took a while for it to boil again!). 3. 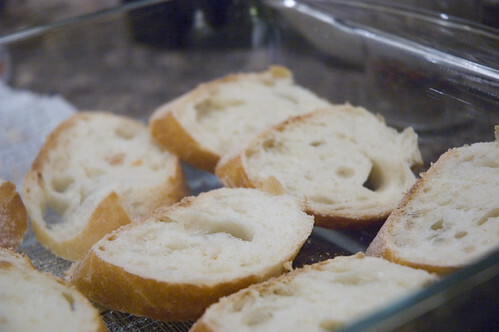 While the seafood cooks, cut the baguette on the diagonal into 1/2 inch slices (you'll want at least 9!). Put all but one of the slices on a baking sheet and toast both sides in the broiler, about 1 minute each side. 4. Drop the remaining garlic clove down the chute of a running food processor (I advise at least 2 cloves for yumminess). Stop the motor and scrape down the sides of the bowl. 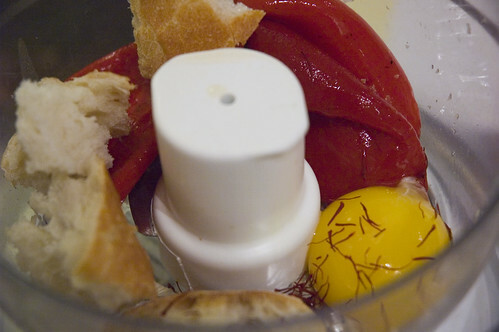 Add the roasted peppers, egg yolk, reserved bread slice and remaining 1/4 t saffron. Purée, then, with the motor running, gradually add the remaining 7 T olive oil through the chute until it has the consistency of mayonnaise (PERSONALLY: at this point I taste, and added some sea salt and about 1 t of red wine vinegar to add some punch!). 5. Divide the soup among 4 bowls. Spread the rouille on the toasted baguette. Serve any remaining rouille on the table. Enjoy! Mmmm...I love a good QUICK bouillabaisse. I have a similar recipe that you might want to try one time. It essentially the same, just add some fennell bulb, and the juice & zest of one orange when you simmer the soup. Very yummy.